This issue of my Tolkien Transactions is already much delayed, and there is, I think, no reason to delay it any further. It does seem to me that I must have missed some things at the start of the month, but though I have tried to look back, it is a feature of my RSS reader that posts that I have marked as unread nonetheless disappear from sight after little more than a month. On the on-line launch party for Tolkien's Beowulf translation that the Tolkien Society organises along with others. The winners of the first Tolkien Society Awards — congratulations all! ‘The Concept of Time in the Medieval World View’ (2 Apr) — The concept of time is of course also hugely important in Tolkien's Faërie, so this article is quite interesting, though I would have liked to see even more about the meeting of secular time with eternity. ‘Returning the King: The Medieval King in Modern Fantasy’ (5 Apr) — A 2012 Master's Thesis. ‘Enabling Love: Dwarfs in Old Norse-Icelandic Romances’ (27 Apr) — On the role of dwarfs in medieval and later folklore — including a role as enablers of love. ‘Boethius’s Misguided Theodicy: The Consolation of Philosophy’ (28 Apr) — Anicius Boëthius is often mentioned in relation to Tolkien. Though I think it is often because Boëthius offers a philosophical foundation that is medieval and yet relatively accessible to a modern audience, it is nonetheless relevant for the student of Tolkien to also keep an eye out for insights into the medieval religious philosophy represented by e.g. Boëthius. You do know, I trust, that Tolkien identified himself as Mercian or Hwiccian, but how well do you know the history of Mercia and Hwicce? My own knowledge is certainly not above appreciating a bit of a history lesson on King Offa of Mercia. Andrew Higgins has started blogging on the Tolkien Society web-site, calling his series of blogs the ‘Travels on the Oloremalle’ (referring to the Olórë Mallë — the Path of Dreams — in The Book of Lost Tales). Andy is doing a Ph.D. on the earliest stages of Tolkien's mythology, and his bloggings are a must-read for anyone interested in the genesis and emergence of the Middle-earth mythology. A report from a speech by Maria Cecire on ‘Unfashionable Creatures: Tolkien’s 1931 Curricular Reforms and the Fantastic Imagination’ at Brandeis University. Being of a scientific persuation myself, I might wish for just a bit more justification / confirming evidence (in the Bayesian sense) than just getting the hypothesized cause before the proposed effect, but otherwise I largely agree with what Martinez has to say here. Here Andrew, in addition to talking about his current projects, gives some excellent resources for someone interested in trying to understand something of the mind-set of the literature with which Tolkien grew up and which he studied while at university (perhaps it would be more appropriate to describe it in the plural — the many mind-sets of many authors that all form a part of that leaf-mould of the mind in which Tolkien's works grew). Along with an introductory discussion of the poem, Jones compares a few lines from Tolkien's alliterating translation that are, IIRC, known from Michael Drout's work on Tolkien and Beowulf, to Heaney's 1999 translation. A coherent argument from someone who is not herself a fan of Tolkien's fiction, but a huge fan of his work on Old English. ‘This is what sets [Tolkien's] Middle Earth [sic] apart from [...]: those lands have fine yarns, but they never taught me anything about myself.’ Need I say more? This is exactly what sets Tolkien's work apart: it allows the attentive and thoughtful readers to learn something about themselves! The question of religious meaning in Tolkien's work is probably always going to be contentious because people will insist on reading their own meaning into his work, and thus tend to either exaggerate or understate the importance of Tolkien's own faith in shaping his work. Sometimes it is merely a matter of language — I am often far more comfortable with a statement that ‘this is what I get from reading it’ compared to the claim that ‘this is what Tolkien intended us to get from reading it’. In any case, I have long since found that a bit more than a passing knowledge of medieval Catholic philosophy is invaluable when trying to carefully excavate deeper layers of Tolkien's work. Commenting on her review of Dictionnaire Tolkien from Medievally Speaking (see last month), Anna Smol takes up on the question of the translation and reception of Tolkien's works in other languages. This is indeed an interesting topic. Most of the discussion that I know of looks at single languages (comparing translations, discussing translation choices etc.) and it could be interesting to see a thorough study of translations in general (there is Allan Turner's contribution, ‘A Theoreticl Model for Tolkien Translation Criticism’ in the book Tolkien in Translation (ed. Thomas Honegger, Walking Tree Publishers, Cormarë series no. 4). An interview, in German, with John Garth, about his book, Tolkien and the Great War, which has been published in German. The description of the TCBS core as believing with ‘jugendlichem Übermut’ that they could help change the world through Art sticks out — if the interview was conducted in English, I suspect that Garth did not use ofermod to describe the TCBS, but it might not be wholly inappropriate. An interesting interview with Dr. Reid who will be teaching a course on the cultural studies and audience reception approaches to Tolkien's work. A good interview with Jenny Dolfen — mostly about her newest project, ‘Darkness over Cannae’, but of course it is not possible to avoid Tolkien entirely. 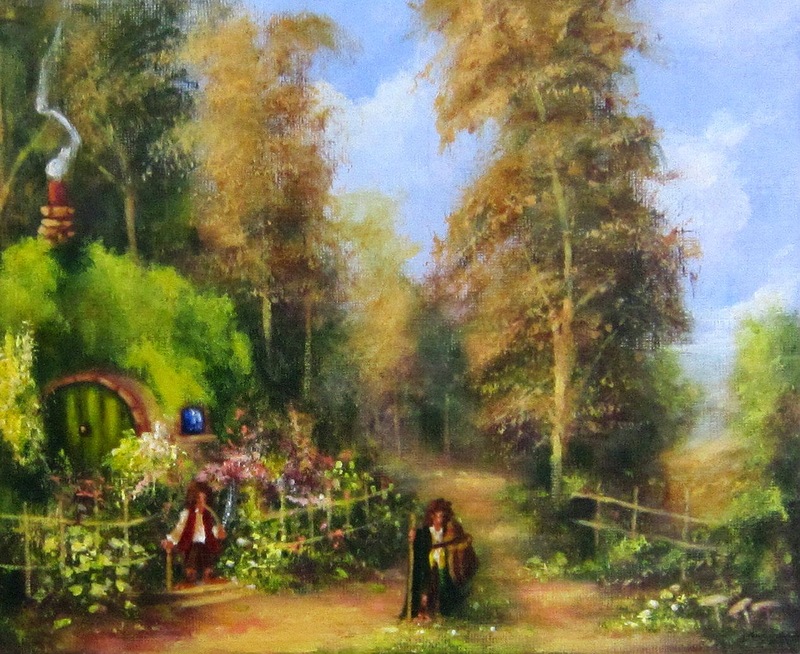 On the Tolkien-inspired art at HobbitCon — and yes, those artists really are good! Gimli being knighted by Galadriel — an interesting way of showing the bond between the two. A scene from Three is Company where one of the three Hobbits (Frodo? He's a bit sturdy, as Frodo was when they set out, and seems the older of the three) is looking behind them with some concern, listening, I think, for the sound of hooves. A knitted Gandalf ... and he's a wonder! A single Tolkien-inspired work, but otherwise also a fantastic gallery of artwork from a book of art by Ian Miller — including dragons, and ‘the world that contained even the imagination of Fáfnir was richer and more beautiful, at whatever cost of peril.’ Though not (at least not all of them) Fáfnir, Miller's dragons do make the world a richer place. Posted on the day after St. George's day, this article on dragons in general seems highly appropriate. Looking at the plausibility of dragons is, of course, a bit of good fun, but as Tolkien also knew, there is something incredibly attractive about the idea of the Dragon — something that leaves the world both richer and more beautiful for being. This month, being late and all, I've just reduced the list to those who have posted in April (whether Tolkien-related or not), without giving details on posts not discussed above.